The standard method of order entry is designed to enter, process, ship and invoice orders. It is not designed to apply deposits, pre-payments, or credit memos to all type of orders in COP. To enter a deposit or pre-payment, the user usually receives posts the deposit in A/R Cash Receipts and applies it as an Open Credit to the customer. The Standard Processing Method does provide the function to apply an “Amount Paid” to COP type “I” orders. This works reasonably well if the invoice is immediate or an over the counter sale. When a Standard Method COP type “O” order is selected to bill and the invoice printed, the printed invoice will show the entire invoice amount as the Balance Due even though the customer has a deposit, pre-payment, or credit memo against this invoice. To lessen any misunderstandings with the customer and his invoice, the deposit could be referenced in the Invoice comments. After the invoice has been posted, the COP user must go to A/R and Reapply the open credit to the invoice. If they are not authorized for this A/R process, they must notify the A/R user and explain the situation. Until the Open credit has been reapplied to the invoice, the invoice remains open and is reflected as such in the customer credit history and financial status. 1. Cash receipts and A/R are not updated until the invoice is posted. 2. If invoice originated as an order, do you withhold processing any “Amount Paid” until the order is filled, shipped, and ready to invoice? Or, do you post payment as an open credit and reapply after the order has been invoiced and posted? 3. Who handles cash, the A/R Department or Sales Processing Department? NOTE: For terminology purposes, Deposit is synonymous with cash received, cash applied, partial payment, and pre-payment. The Deposit Handling Method resolves all the Standard Method Process issues by posting deposits as an open credit in A/R and linking them, automatically or via a popup window, to the COP Amount Paid field. Additionally, it gives you the controls to establish a centralized cash receipts process. 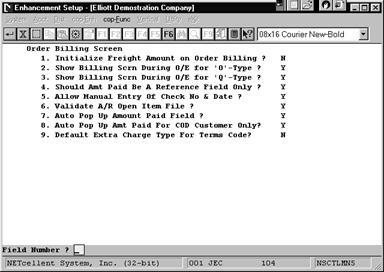 This function works with “O” and “I” type orders by allowing users access to the billing screen during regular order entry processing. This function will also let you apply open credit memos in the Amount Paid field of the billing screen. This is especially important for COD Customers when the COD amount due must reflect a deposit or an open credit memo. If the COD amount is not correct, customers may refuse shipment or become upset if their deposit or open credit memo is not applied. Does not apply to deposit handling. 2. Show Billing Scrn During COP For “O” Type Orders? Answer “Y” if you want Sales Order Entry people to access billing screen to enter payments, freight, miscellaneous charges or comments at order entry time for “O” type orders. Answer “N” to use the Standard Processing Method. 3. Show Billing Scrn During O/E For “Q” Type Orders? Answer “Y” if you want Sales Order Entry people to access billing screen to enter payments, freight, miscellaneous charges or comments at order entry time for “Q” type orders. Answer “N” if you do not need these features for “Q” type orders. 4. Should Amt Paid Be a Reference Field Only? If you answer “N”, Deposit Handling will be disabled and the cash receipts processing will use The Standard Processing Method. Answer “Y” to enable Deposit Handling. If flagged “Y”, the Amount Paid on the Billing Screen for “O” and “I” type orders will not post as a cash receipt. However, and since the system is using payments/open credits from A/R to populate this field, the printed invoice will reflect the correct Balance Due amount. Upon posting the invoice, the system will Re-Apply the payment/open credit to the posted invoice. 5. Allow Manual Entry of Check No. and Date? If answered “N”, a window will popup allowing you to define up to 5 Supervisors (users) who can manually enter a Check No. and Date. This is a security feature to ensure data accuracy and only let the designated supervisors make adjustments when a situation exists outside normal operating procedures. However, non-supervisor users can still use the F3 Key to select the Open Payment amount and automatically populate the Check No. and Date fields with the values of the Payment/Credit. Answers “Y” to let all users manually enter Check No. and Date. 6. Validate A/R Open Item File? 1. Y=Yes 2. W=Warning 3. N=No. If “Y”, the system will validate the check number and date in the A/R Open Item file. If it cannot validate the Check No. and Date, it will not accept the information entered and will prompt you for a valid Check No. and Date. If “W”, the system will issue a Warning Message, but let you proceed with the Check No. and Date as entered. If “N”, the system will not validate and accept the Check No. and Date as entered. Note: These same options and rules apply if you are processing an open credit memo against an order. 7. Auto Pop Up Amt Paid Field? This function will automatically populate the Amount Paid, Check No., and Date fields for a Credit Balance Customer with their open payment or credit memo. Answer “Y” to enable this function. Auto Pop Up will only work for Credit Balance Customers. The system only allows one open payment/credit to apply per invoice and if the customer has more than 1 Open Payment/Credit the system will display a message saying “Multiple Unapplied A/R Open Item Records Exist.” However, you can still apply multiple credits per invoice using the procedures detailed in the Processing Order Entry section of this manual. 8. Auto Pop Up Amt Paid For COD Customer? This is the same function as flag #7, but for COD Customer only. If you select “Y” for this function, it overrides and disables flag #7 if it was answered “Y.” This enhancement only works for customers with COD Terms and credit balances. 9. Default Extra Charge For Terms Code? A. When Reference Field Flag = N.
System follows the Standard Processing Method. Data entered in the COP Billing Screen will not update A/R until the invoice is posted. Fields 5 through 8 will be disabled. Fields 2 and 3 will be functional if flagged Y. Any information entered into the Billing Screen will carry over to the invoice when the order is selected for billing. Unless you want to hold checks until invoicing occurs, you must create open item cash receipts in A/R and then reapply once the invoices are posted. The system will not post or create any transactions for the amount entered in the Amount Paid field.